I think you know why I’m writing this letter. Do you think I enjoy sitting around all day on my orthopedic doggie bed watching Stedman complain about the dust on the wainscoting? Neither of us has seen you for months. After you tape the show, you’re always out with John Travolta or Barbara Streisand or that horrible personal chef. I can’t even remember what you look like. You have neglected your own dog for so long that I was forced to learn how to use a keyboard and take English courses through North American Online University. Do you think I chose this sordid path, Oprah? Think again. You did this to me. I just want to be a normal dog. 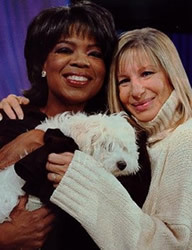 When I read in an issue of O that the “road to personal happiness” is spending time with your loved ones, I was shocked. You never spend time with me, Oprah, and that is why I must go. Cars for an entire studio audience and I still have to wear a collar that smells like a mold? That was not only an obvious marketing ploy, but a sad statement about our relationship. I am going to look for a job in marketing and it will be tough because I only speak in howls and barks, but it will be better than this life. I want to let you know that I peed in your new custom-made closet. And I licked all 134 doorknobs and I think I’m getting kennel cough. Diana Wurn is a freelance writer who practices telepathy with wild squirrels. Her writing has confused readers of The Brooklyn Rail and The Seattle Times. When confronted, she pretends to be working on a screenplay.
" . . . and for the first time since Arbor Day, I truly felt alive."